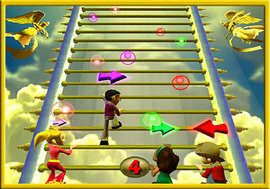 The Bible Game is just one of the games with religious themes explored in class. 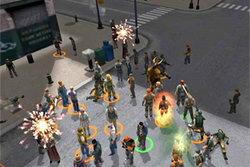 Here are more of the video and online games Professor Wagner uses in her class. In every class we explored the digital universe -- for example, by playing in the world of Second Life -- and discussed how those experiences overlap and interconnect with our real-life experiences in religion and ritual. The study of virtual reality is another platform on which to understand religion and to answer the most basic questions about human existence, the importance of community, our ideas about life and death, and our notions of what is real. 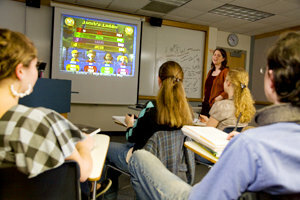 Professor Wagner discusses the Bible Game with her class. The study of religion and virtual reality is largely uncharted academic territory. Many scholars are writing about religion as observed in popular culture and the media, and some even touch on religion’s relationship to technology, but Professor Wagner says very few are bringing all these elements together. This topic truly is a vast, interdisciplinary one. To help students sort through the mess of tangled questions, Professor Wagner had the class read passages from video game theorists (ludology is the fancy word for this study), religion scholars, and others about ritual, and then it was our job to make connections among the different theories. In one class, we examined a scene in the game Resistance: Fall of Man in which players kill monsters in Manchester Cathedral in England. As members of our class of 12 took turns playing, we debated whether committing violence in a virtual church was as sacrilegious as it would be in real life. 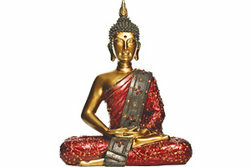 Can the virtual world have sacred space? If it does, can it be desecrated? As we struggled to answer these very complex questions about space and identity, Professor Wager kept the course relevant to the class by equipping us with a critical eye for media consumption and insights about the daunting future of new technologies -- important topics for us as students and young adults alike. Professor Wagner used an educational initiative grant from the School of Humanities and Sciences to purchase a Sony PlayStation for classroom use. 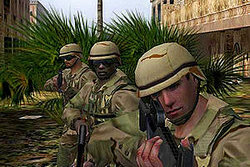 We played games with explicit religious themes, such as the Bible Game and Left Behind; we explored church communities and traveled to virtual Mecca in Second Life; we also examined online social advocacy games, such as Darfur is Dying, and other games that mimic real world events, such as Kuma War, a online multiplayer simulation of actual missions in the Iraq war. With every game we played, we always returned to basic issues of identity and community. In cyberspace, human beings are represented by pixels and code, text and images. 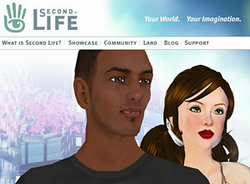 What does a player’s avatar in Second Life represent? How does the anonymity of the virtual environment influence our behavior? What choices are we making when we represent ourselves on networking sites like Facebook? Does cyberspace present the opportunity to create the ideal self, as envisioned in heaven? Although the class is over, Professor Wagner continues to search for answers. She is currently writing a comprehensive book on the study of virtual reality and religion, and in it, she will give credit to all of her students for their insights during this course. The study of religion and virtual reality raised more questions than we were able to answer. When thinking about things like religious identity online, virtual sacred space, and what happens to rituals when they are digitized, we found that the conclusions depend on individual experience. This is likely because religion and virtual reality are especially personal experiences. Still, there's little doubt that when religion and virtual reality meet, we are prompted to ask questions that are extremely relevant to our lives as students, media consumers, and human beings.